I am more than delighted to unveil the next software release to you! The release is ready when you read this. In order to get it onto your NEEO quickly, make sure to check out the "how to update your NEEO” section below. As always, many of the new features are strongly influenced by all the discussions and the feedback you provide on Planet NEEO. Thanks a lot for being so active! All these customization options are available via the NEEO App by choosing “Edit slides” on the top right within a recipe or by going to the settings in the NEEO App and then choosing “Customize Slides” after clicking on a recipe. Of course there is a ton more. Thanks to a bunch of change in the background the NEEO experience has been further improved for more speed, even higher reliability and overall snappier performance. In addition to a bunch of SDK changes we also enabled support for hidden SSIDs. Below are the full release notes for everyone who loves to know the details. Also, check out the Known Issues for this release. Once the update is available it will show up in your NEEO App as well as on the NEEO Remote in the top right corner with a red dot with an exclamation mark. All you have to do is opening the NEEO App and then follow this red exclamation mark, you’ll then be guided through the process. We have also prepared a little guide. Be aware that it may take a few hours until your NEEO Brain shows the update, not all of them download the update at the same time, so give it some time. A little hint from me: Rebooting the NEEO Brain initiates a firmware check and speeds up the download process. Fixed issue when Sonos did not update the correct state - for example after a Sonos firmware update or when you cleared the Queue. Fixed issue when Sonos could not be controlled anymore. Improved command queue handling, commands for other devices should not be blocked anymore if a single device is causing issues. Device recipe slides can now be sorted and disabled. Display Fire TV hardware details during discovery. 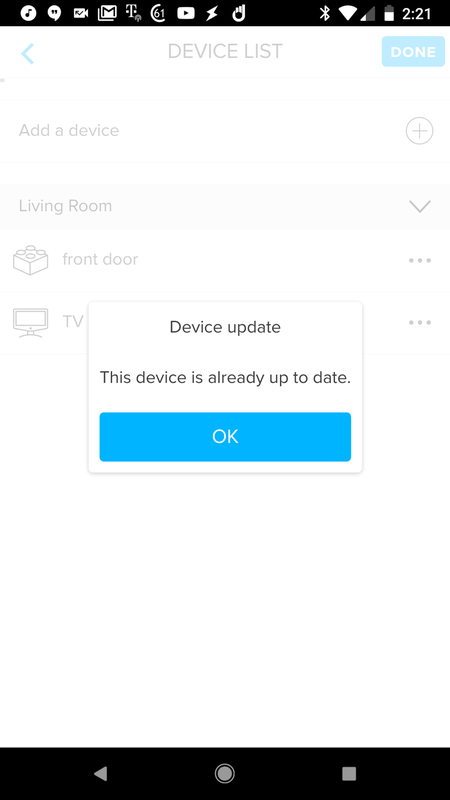 Fixed a rare issue where Sonos, Hue, FireTV devices were no longer visible when trying to add a new device. Improved memory and CPU usage. Fixed issue that the NEEO Brain was getting a new IP Address after a firmware update. Added specific error message when a recipe cannot be executed because the queue is full. Fixed strange fork and other weird icons in the top-left corner for some scenarios in the Mobile App. Show registered SDK adapters directly in the NEEO App in the menu "SDK Integrations" in the NEEO Brain section of the NEEO App settings. Registered SDK Adapters are now saved, so no more need to restart these after rebooting the NEEO Brain. Improved CEC discovery for Amazon FireTV. Fixed issue where LIFX, FireTV and other devices were no longer controllable after a reboot of the Brain. Fixed issue where Spotify was not browsable. Added feature to connect to non-broadcasted (hidden) WIFI SSIDs. Device recipes slides are now shown according to the settings in the NEEO App. Recording widget now uses the same icon for "My recordings" as in NEEO App. Fixed memory leak when processing Neeo-link messages. Added reset of wifi chip if the connection to NEEO Brain fails. Improved FTUE screen explaining how to press the button for pairing on NEEO Brain (only 1 second for pairing). Added support for Hidden SSIDs. Improved image downloading to prevent delay of any other processes on slow wifi connections. Full SDK Release Notes are available here. Isnt this available in Denmark yet? Michael Sørensen The release is available around the world right now. It might take a while to show up. As hinted, give your Brain a reboot and then wait for about 15 minutes, that will make sure it checks for an update and has time to download it. NEEO itself can be bought here in Denmark. Patrick it was the firmware update i meant, but nice to see in with danish prices. is currently considering an extra brain in my sons room for complete control:). Michael Sørensen have you tried the app on your mobile device, then go to settings? Great! Can't wait to jump into this. Now I need some custom icons and renaming for shortcuts! I'm curious and happy to try out the new features. Alun Jones Do I assume correctly that this is shown after the update? What is the led on the NEEO Brain doing? Patrick No. Hit the exclamation mark in the app and hit the 'Sure I want to update' button, then immediately get this. Tried it several times. Solid white light on the brain. Alun Jones Make sure to fully close the App manually, then try again to connect. If that does not work, try rebooting your Brain. Let me know if none of that worked or if you have already tried. Alun Jones Give it a few minutes after the reboot, it is now downloading the firmware, once ready the red mark will appear again. Patrick Update seems to have worked with new brain version showing correctly. Remote is 'Starting the upgrade process'. Alun Jones Good to hear that. Thanks. for letting us know. Alun Jones I've exactly the same "issue". How look did it take before brain was updated after reboot? I'm waiting for ca. 20 minutes now... THX! Peter Boeijen That depends a lot on your location, speak "connection speeds to the servers". Still nothing showing on the firmware update screen at all?? Peter Boeijen It can vary and it's not always dependent on the reboot. Let's wait as it can always take up to an hour. How about support for mystrom? Jose Morales We currently have a beta being tested, it is not far away. Patrick that’s nice, do you have a test flight version that we could participate? Jose Morales I need to check with the developer team if we have spots left. Just installed the new firmware - works like a charm. Thanks! Jeff uhm, where did our communication go regarding configuration of hardware buttons? Niklas Greve I moved it to another topic. I also commented on it and tagged you in it. Jeff I see, thanks for clearing it up! Yes! This is the updating I've be waiting for, to finally make Neeo the go-to remote for the rest of my household. All updated - works great! Really enjoying this remote!! Is there an easy way to reboot the Brain? I don't like pulling the power out of things and I can't find a reboot option in the app! You would need to unplug the power cord and then plug it back in. Adam We don't have a reboot option in the app yet. It is absolutely no problem to pull the plug. You can't also just wait till the update shows up, it might take a while. I must be missing something here as I saw no « new slide » option, only the existing shortcut page. Also noticed the light recipe normally shows « light » at the top of the screen but when you hide the default slide (keeping only the shortcut slide) this changes to the name of the first shortcut?!? Hello! You would launch a recipe and then use the NEEO app to follow these steps: Tap on the active recipe under "Now Active" > tap on the hamburger menu located on the upper right-hand corner > tap on "Edit Slides" > tap on the numbers located on the top right under the 'Save' button. This will allow you to re-arrange the slides. Hi, that part was clear, but how can we create new slides? Jeff that is re-arranging, not adding. Upgraded (after having to reboot like some others). I have noticed that now my tv controls (as this is all I am able to use it for) the button presses seem to be sticking. For example I'm going to type in some things in the tv keyboard (using the directional arrows and center button to navigate the keyboard). If I single tap one of the buttons it seems to sometimes add multiple presses. for example I highlight the letter "a" and then click the center button (enter) and it'll send "aaaa" sometimes. Or pressing the right arrow once, it'll move it between 1-4 spaces sometimes. This happens on the digital controls(phone app controls) as well as the physical buttons on the remote, making it pretty much unusable. Frank Montanaro Can you please try and reboot your NEEO Brain once more. Also, can you confirm that this was not happening before the update? What is the make and model of the device that this is happening on? Frank Montanaro can you give us which tv model use? just for clarification - with tv keyboard you mean the on screen keyboard of your tv, right? Michael Vogt Jeff I rebooted and the problem still persists. It seems reproducible if you press a button in quicker succession, if you pause like a second in between button presses it moves one at a time (of course, this isn't the way it should be, it should move once for every one push of the button, no matter the delay in between). Frank Montanaro thanks - do you keep the button pressed on the neeo remote? and you see the same issue using the mobile app, correct? Frank Montanaro I noticed same behavior when using AVR to switch between channels "Pressing button Net" to move from Pondora -> NAS -> Spotify - Net Radio. Frank Montanaro Looking into this for you. I will follow up with you soon! Jay Choudhary Can you also confirm this was not happening after the software update? Jay Choudhary Have you tried to reboot the NEEO Brain to see if this changes anything? Frank Montanaro Hi Frank! Can you please delete the Tv and re-add it? Let me know if this helps. I am having a member of our driver team look into your Tv as we speak :). Frank Montanaro Hello! Yes, if you already have the Netflix button on the original remote we can add it. Same applies to the "Internet apps" button. Jeff Oh the buttons are already there (in the app and on the actual sony remote). They just don't work in the neeo app/remote. Never have. Open the NEEO app > tap on settings > tap on devices > locate your Tv and tap on it > tap on check for update. After the device has updated you can test this once more. Jeff Thanks Jeff, does it take a bit to get the update? Currently (40 minutes later from your post) it says no updates available yet. Frank Montanaro Can you confirm you're updating the device and not the firmware? Can you send me a screenshot of what you're seeing? Frank Montanaro Can you try the Netflix button once more. Maybe the device was updated and we did not notice. Jeff Nope (I tried that already) it's still a no-op when I press it. 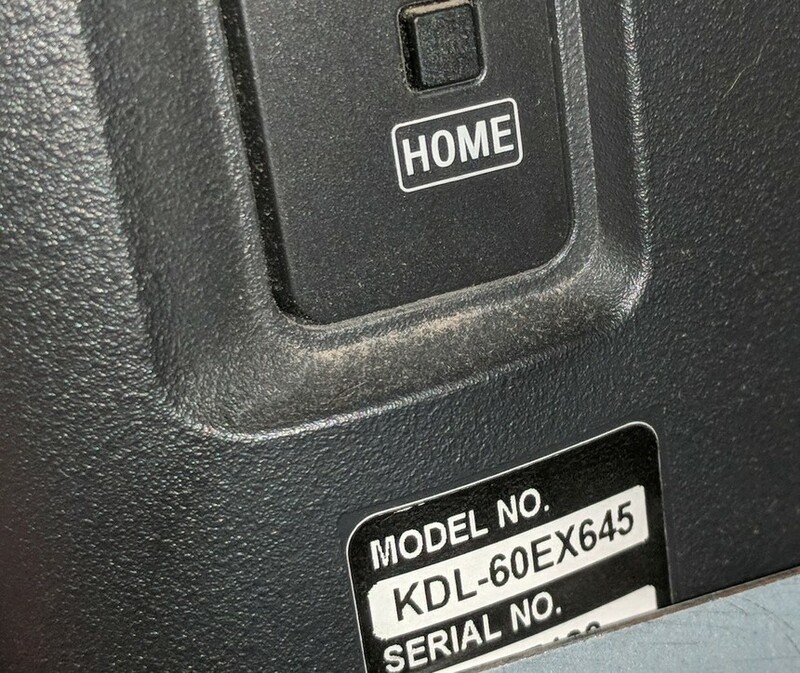 In your most recent post when I asked, you're now stating its the Sony KDL60EX645. The update was made for the Sony KDL46EX645. Frank Montanaro So you have the Sony KDL60EX645 :). I will have our driver team look into this asap for you. Frank Montanaro We went ahead and made the changes. We expect them to kick in at 5pm PST. Please try and update the device around that time and let me know if the Netflix button works. Frank Montanaro Good to know :). When you say the internet apps button. Are you referring to the "Menu Home Tv" button? I have a very similar Tv as yours and that is the button I use to access my apps. Jeff Actually might not be a neeo problem, i'm trying to access them through the menu (the internet app selector) and just nothing happens. I don't have batteries for the original remote or I'd try that, but I'm guessing it's just bug in this old TV. Frank Montanaro The Menu home button I described should accomplish the same. When I press this button on my Sony Tv I am able to access any installed apps like YouTube, Sling Tv etc... Let me know if I am understanding you correctly. Patrick As I just wrote to Jeff under the old Post, LIFX still isn't working for me. Chromecast was discussed with Jeff mostly via DM, but that also isn't any better after the upgrade. Pause/Play of Chromecast works on a fresh reboot of the Brain, but quickly craps out - not sure if it happens after a period of time, or after running another Recipe, but it dies very quickly... Pause/Play buttons stop working. This was discussed right away after the last upgrade.... I had hoped you'd address it in this release. Thank you. I'm curious how it works. No more confused looks from other people using the remote. Now you can finally hide uninteresting / irrelevant things. Great. Only the Messages improved or also the general Handling???? milo I own a Z-wave light bulb that I was personally having issues with on my NEEO. As I was beta testing this firmware (and subsequent fw's) I have noticed improvements with the slider and inlcuding the device. While I never experienced the "Unknown device" issue, I was able to successfully add it and have constant control of it. Before, I would lose control of my light bulb and lifx mini after using them shortly. Please let us know if you see any improvements in this matter. I cannot find how to create a new slide. Did someone found a way to do this ? Why do you need a new slide? Basically I guess the new update is not able to add a new slide. But all required slides are already available and now you can change the order or hide some slides. Moreover you still have the shortcut screen where you can add additional buttons or widgets. Stefan Braun I'd like to create more than one shortcut screen to manage my lights and stores on one screen (z-wave) and my audio-video device on another. Raphael said in his post that we can now "create new slides with shortcuts". This is the feature i'm looking for. Nicolas Philippe As far as i know, creating new slides is currently done via the shortcut page and the widgets and buttons that can be added from each device. Filling up one pages, leads to a second one and so on. there is still a way to improve this, but i'm also confident, that this will be done by the Team behind NEEo, as this is only the first step to customization. Nicolas Philippe Ah I know what you mean. I would vote for your idea, if you create a feature request. :-) But what Markus and Michael mentioned, this works as well pretty good. Have you tested this? But you are on beta, correct? On 49.10 adding shortcuts leads to a slide that requires scrolling down, not new slides. Which is not ideal because there is zero visual indication you can or indeed should scroll down to find more commands. Geert Van Der Linden I don't use it and I only heard about the possibility to make own slides from shortcut page, maybe I also got it wrong. Markus Mahr ok, no problem. Was hoping you had found a way to do this after all. It is pretty clear it is not possible. We can hide unused slides, re-arrange them and use the shortcut page to duplicate useful commands and hide one more standard slide. This goes a long way in cleaning up so it is definitely a useful feature. But it would be nice if somebody from the team confirmed that you may have oversold the « fully customisable slides » so people can stop wasting time on looking for an option to add new slides. Relates to? Is it Sonos specific or did Neeo finally release proper Spotify integration and I missed it ? David Hall if you were logged out from Spotify, we did not automatically login again. Can you describe what you mean with "proper Spotify integration" - was is not proper in your view? Markus Mahr David Hall can you tell me more about, what exactly you would like to do? My understanding is, that you would like to control Spotify Certified hardware - which hardware are you guys using? Michael Vogt as example my AVR is capable of Spotify connect, and also all amazon Echo devices are able to get the stream. There is lots of hardware available that can handle Spotify connect, so u use neeo to select what you like to hear and then neeo lists all available targets ( like the Spotify app do) and you only need to select where you like to hear the music but neeo is used to control the different devices. Exactly, that would be a very cool feature! David Hall There seems to be a feature request already. Vote on it so Neeo team will give it priority! This would be very helpful for me too. I frequently listen to spotify music on my phone, and when I get home, I can continue listening on my AVR that supports Spotify Connect (Marantz NR1607) by just tapping on the "Devices available" button on the app. At this point with the Neeo remote I can only launch a barebones AVR recipe to have pause/next/volume control, but I can't choose playlists nor see the current playback status. Is it possible yet to rename screen buttons or even change a hard button to a different command? Update is installed and I´m able to customize a little more. I´m able to re-order the slides and show/hide them. Good improvement and keep up the good work...but I haven´t found a way to edit/customize existing slides or create a new / additional one. Why do I want to edit/customize existing slides? Correct names of some buttons (Smart Hub vs. Menu), location/order of the buttons or to show/hide them. New slides would be great so I really would be able to customize it the way I would desire...buttons "I" use most (think everybody uses his remote differently) on my 1st screen. BTW just discovered that "Sunrise/sunset" would be a nice feature to integrate in "recipes". (unsure if it should be "time of day" or "sunrise/sunset") I´ve created my recipes for e.g. switching on my TV/XBOX/DVD-Player in winter when it was dark (early). These switch on the device and also the Hue lamps in that room. When in day- or summertime I don´t need the lamps to be switched on (that early). Peter Boeijen If there are no direct Buttons for the apps, or direct calls from the original remote, i don't can imagine how this can be handled. I mean the Favorites are sending the Numbers correlated to the channel they are saved, for the apps it must give an direct link as well (from the TV manufacturer) else this is not possible to be reliably done. If there are direct codes that the original remote uses, the device driver team might integrate them for your tv model, but otherwise i don't see this happening without an Readout and direct link to one of the apps. Peter Boeijen Maybe Andy can provide you a live test for the Netflix (and Amazon or else) Buttons and you can check if you are able to load the apps via these codes, if so, Andy can for sure integrate these codes to your TV model and you are then able to direclty access these. Peter Boeijen Hi Peter! Unless I missed it, can you please provide me with the make and model of your Samsung Tv? I can have my colleague look at the NetFlix IR code asap and have it fixed. Peter Boeijen Thank you for providing us with the make and model. We’ll get on it as quickly as possible :). Unkess your remote has a dedicated Amazon Prime Video button, we cannot add this. It would have tonore-exist directly from the manufacturer. Markus Mahr Update - the driver for my TV (Samsung UE55F8090SLX) was updated last night. Driver version number went down from 66 to 2...but the Netflix-shortcut is now integrated! :-) Very cool! Peter Boeijen Hi Peter! I ended up removing my reply as I sent it prematurely. Looks like the update happened after the actual update happened on the server side :). Glad to hear its working and I am not too sure why it went down from versions, but I am glad all is good. In our database, we had it ;). Not too sure other apps will be available as only Netflix is available. Jeff THX again! Would love to hear how you managed to include the Netflix shortcut, perhaps we (community) could help to improve the drivers and include these kind of cool things as well! Jeff is it possible to integrate Netflix with amazon fire tv ? I would love to click Netflix recipe which starts my tv -> avr -> firetv -> Netflix app and start my the show I like :). Even better if I can browse TV shows on Neeo app :) . Jay Choudhary not possible with the FireTV and such an integration, since there are no dedicated HDMI-Cec codes for starting apps. Markus Mahr thanks , how about api calls from backend which can be integrated with Neeo? Jay Choudhary Markus Mahr If you want to tinker with the SDK this can be done for firetv. I don't have any programming experience, just merely a hobby so I have kind of pieced it together over time. You need to enable debug on your firetv, and run adb through the SDK. Then you can add 1 button shortcuts to launch apps. Markus Mahr It takes about 1-2 seconds to launch the app after the shortcut is pressed. I could definitely see issues with that delay if you were using adb for all other functions (scrolling, selecting, playback etc.) I strictly use adb to launch apps and use HDMI-CEC for use of the fire tv control. Best of both worlds I feel considering there is no other alternative that I am aware of at the moment. Aaron Ranson Yes, that is the timegap i also discovered. For controlling the device, it is not doable. An Intermix from SDK and HDMI-CEC or IR Driver is currently also a big hurdle via NEEO and the SDK, but yes, it is possible. Hopefully this all will be gone, when using bluetooth is possible, and or also the SDK and the functions of the NEEO will be enhanced. Jay Choudhary I accomplished a single button push on NEEO that starts the various hardware then the app... on a smart TV though. Mine used a low tech approach, using a macro NEEO provided for me to cursor over to the app (e.g. Netflix) and click it. Not fancy, but I love having the convenience. I mention it in case it would be possible to do in your case. so wow. i can now re-order the slides. really? this is it? i want to rename functions, have other pictures for them - have my very own design and arrangement for only one slide with all the functions i need. Sebastian Prehn the more updates are followed, the more of your requests are build in. This is only the first step and as NEEO don't whant to do "big, heavy and less" updates, they do the "small, feature by feature and more" update way, this means with every update there are small changes for the user but the more you get, the more are in there. also sometimes a feature needs tweaking basic code and this change can't be done in one single day and needs proper testing with all involved other / on top possibilitiesy. Markus Mahr i don't know how long neeo would like to make "first steps". there are a lot of features that should already be build in - but yes, it will be nice to have a cool remote in maybe 3-4 years...the community is there and is just waiting to do the cool stuff everybody wants - let them do it! i do not see any reason why this ideas have to run on another piece of hardware! Sebastian Prehn There are allready running drivers build in the brain, but that leaded to some errors (stopped working under circum stances) this is all for testing and if the team imporved the working way and all major bugs and hurdles are cleaned, they will open the system to community drivers. Thats what they allready told in other posts. i don't think this will take 3-4 years. They are making good way to implement things and killing bugs, for the amount of people that are behind the remote. Sebastian Prehn I agree. The update was described as being able to "fully customize your slides". Until we can move individual buttons around and organize individual slide's functions, I can't get too excited. This is a nice addition however. NEEO ist updated, that's fine. After the update, my SONOS-Recipe does not work any more. It seems like NEEO does not connect to the SONOS-Account any more. What do I have to do? Adrian Kambli Reboot your main Sonos Controler (or all) if this also doesn't help, reboot the neeo once more. Adrian Kambli Thank you for reporting this! Can you please DM me your NEEO hostname which can be found in the about section of the NEEO app under settings? Were you able to perform the tips that Markus mentioned? Although I like this new update very much, announcing it with "Fully customize your NEEO screens!" seems a bit exaggerated. Patrick Borner you are right, it’s not the content of the screens but the screens themselves that can now be customized, “screen” leaves some room for interpretations. This was a highly requested feature hence the enthusiasm in the announcement.